World Alliance of Religions: Peace Summit 2014 (WARP) officially began with an opening ceremony, which was full of splendor presented by card section performed by more than 10,000 youth, and message of peace delivered by former presidents and prominent religious leaders. 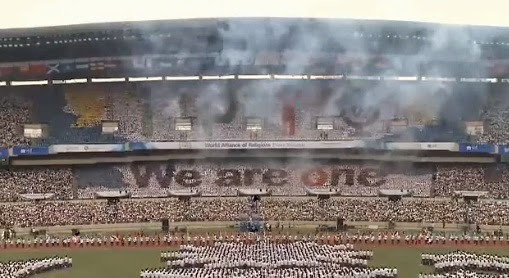 The speakers include Man Hee Lee, chairman of HWPL, chairwoman of IWPG, the Chairman of IPYG, Former President of Romania, Emil Constantinescu, Former vice President of Russia, Alexander Rutsoky, Former Prime Minister of Ireland, Bertie Ahern, and the Former President of Croatia, Stjepan Mesic. The rest ae Deputy President of South Africa, Kgalema Petrus Motlanthe, Cardinal Archbishop of Manila, Gaudencio B. Rosales, Jathedar of the Akal Takht Giani, Gurbachan Singh and Rabbi Shmuley Boteach. In his speech, Chairman Mr. Lee emphasized the role of media in achieving peace stating that, world peace cannot be achieved by only one organization or one country. On day two of the WARP Summit (18th of September), participants will witness the historical moment of signing peace agreement by religious leaders, with former presidents signing an agreement to enact an international constitution.